Prepare the fondue pot: Rub the inside of the pot with a garlic clove; slice and set aside with remaining garlic. Place the pot directly onto the stovetop (ONLY if you have an actual cast-iron/ceramic fondue pot – use a regular saucepan if not), and slowly pour in the wine; heat over a low to medium heat. Add the shredded cheese to wine in batches, adding more cheese as each batch melts. The cheese should always be heated WITHIN the wine. Stir constantly to prevent cheese from balling up. The mixture should never boil, some bubbling is okay. Add sliced garlic. 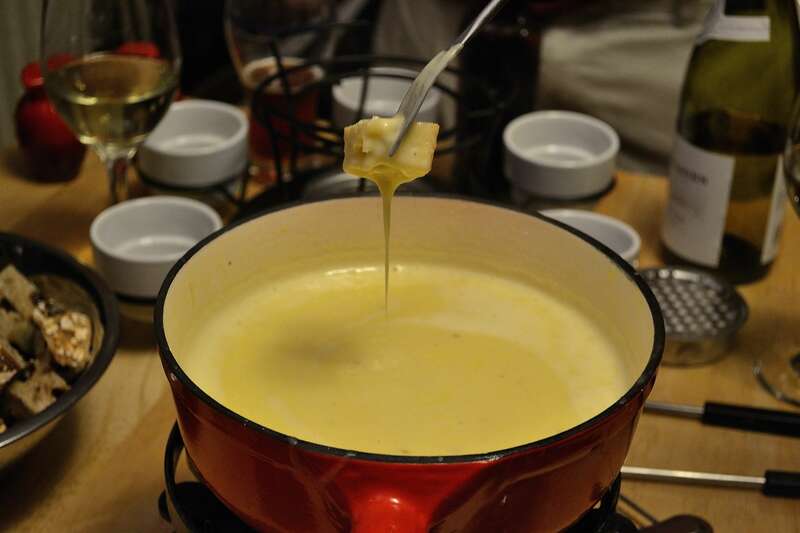 Test the consistency of the fondue: if too thin, whisk a small quantity of wine with some corn starch in a small bowl, then add mixture to fondue. If too thick: add some wine – *There’s a tipping point in temperature where all the cheese melts and blends with the wine, loosening up the mixture, so don’t be too eager to add extra wine early. COOK’S NOTES: When first served, it should be stirred constantly (using a fondue fork and bread chunk) for the first few minutes so that cheese near the bottom doesn’t burn. Traditionally enjoyed with hot tea or a glass of white wine. Swiss folk lore holds that other cold drinks (e.g. water) will cool the cheese into a lump in your stomach. Don’t think about asking why that would be true with water but not with wine. Wine: No need to get fancy, but you’ll want to use a wine that you’ll also enjoy drinking.